Alfredo Stroessner (November 3, 1912 – August 16, 2006) was the president of Paraguay, who ruled the country for 35 years with his Conservative Colorado Party, that exists until now. In his tenure, that took place from 1954 to 1989, he had good relationsships with the United States. 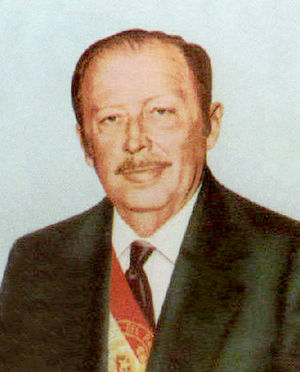 Stroessner fought poverty, but also respected the rights of the landowners. He stabilized the currency and decreased the inflation rate. In his tenure new schools and streets were built. In 1989 Andrés Rodríguez overthrowed him and ruled as dictator until 1993. Stroessner escaped into Brazil, where he died on August 16, 2006 as a result of lung problems. This page was last modified on 9 April 2019, at 00:02.